Birdoswald is a Roman fort on Hadrian’s Wall in north-west England. It’s the sixth fort from the western end of the Wall, sitting on the western edge of the Pennines where the hills start to roll off into the plain of North Cumbria and the Solway Firth. The fort site itself is strategically located on a steep-sided promontory formed by a deep meander of the River Irthing, with wide-ranging views in all directions. It occupies the western end of the communication route across the Pennines formed by the valleys of the Rivers Irthing and Tyne, and commands the crossing of the River Irthing at Willowford. The location was compared to Troy by a romantically-minded eighteenth-century Earl of Carlisle and an estate agent trying to sell the property in 1901. Like most such comparisons a large grain of salt is required – I can’t see many people arriving at Troy, either Homer’s legendary city or Schliemann’s Hissarlik, and saying “Lo, behold the Birdoswald of Asia Minor!” Nevertheless, it’s an impressive, if rather rain- and windswept, site. Scroll around and zoom in and out of the map and satellite image links at the bottom of the page to get an idea. The Roman name of the fort was Banna, attested by an altar found at the site in 1821 and dedicated to the woodland god Silvanus by the ‘Venatores Bannienses’, which translates as ‘the hunters of Banna’. Until recently it was thought to have been called Camboglanna*; however this is now thought to have been a mistake in the Notitia Dignitatum (Wilmott 2001 p. 97). The modern name Birdoswald is first recorded as ‘Burthoswald’ or ‘Bordoswald’ in 1194-1220, when charters granted land there to the Priories at Lanercost and Wetheral (Wilmott 2001 p. 131). The name elements consist of the Old English man’s name Oswald and the Brittonic (Welsh) element ‘burth’ or ‘buarth’, meaning a pen or farmyard (Ordnance Survey glossary of place name elements), so the name means ‘pen or farmyard of Oswald’. The name elements are ordered in the Welsh format, with the personal name second (Old English names are typically ordered with the personal name first, in the format ‘Oswald’s farm’). This suggests to me that the name was coined and established by people who spoke Welsh or its Brittonic ancestor. The most famous Oswald associated with the approximate locality is the seventh-century king of Northumbria, killed in battle in 642 and revered as a saint (Bede, Book III ch. 9), but as far as I know there’s absolutely nothing to connect him with Birdoswald except the obvious romantic appeal of such a notion. Incidentally, I don’t think the ‘buarth’ element of the name necessarily rules out a royal or aristocratic connection. Assuming that the ‘pen’ meaning of ‘buarth’ meant a livestock pen, a place where animals could be corralled, it could refer to the gathering of livestock for payment of tax or tribute as well as to agricultural use. The buildings visible in the north-west corner of the fort on the satellite image are those of the Georgian and Victorian farm, now a modern visitor centre. Occupation at Birdoswald is attested – though not continuously – from the Roman period to 1984, when the last farming tenants moved out. Much of the information we have comes from a series of excavations led by Tony Wilmott in 1987-1998 (for a fascinating, detailed and very readable account, I highly recommend his book on the subject, see references for details). For the purposes of this post, I’ll focus on the post-Roman phases of construction and occupation at Birdoswald on the site of the former fort granaries, discovered and excavated in 1987. Photos of the posts marking the site of the timber halls and the granary foundations on Gabriele's blog here. The Roman fort at Birdoswald had two large stone granaries, built between the central headquarters building (principia) and the west wall, south of the west gate (see sketch plan A). The exercise basilica or indoor drill hall (which must have been a welcome facility in rainy north-west England) and a long rectangular building of uncertain function stood opposite the granaries, north of the west gate (for pictures of the reconstruction of the slightly smaller exercise basilica at Saalburg in Germany, see Gabriele’s post). The granaries were built some time in the second century (date uncertain) and repaired or rebuilt according to an inscription in 205-8. Around the same time, early to mid third century, the south portal of the west gate was walled up (Wilmott 2001 p. 93), leaving the north portal in use. The stone roof of the north granary collapsed in around 350, dated by a coin of 350-353 found beneath the drifts of fallen roof tile, and the ruins were then used as a rubbish dump (Wilmott 2001 p. 118). At about the same time, the south granary had a new stone floor laid (dated by the coins found beneath the floor, which cease in 348) (Wilmott 2001 p.119). This floor later became covered with deposits of silt interspersed with patches of stone, and two successive hearths were built at the western end. Around the hearths were found a fourth-century glass finger ring, a gold and glass earring, and a worn coin from the reign of Theodosius (388-395) (Wilmott 2001 p. 121). The hearths indicate residential use, the jewellery suggests the presence of women, and the presence of jewellery and a coin indicates high-status occupation. This is consistent with the south granary being used at this period as something akin to a chieftain’s hall. The jewellery, coins, hearths and stone floor were found beneath a layer of collapsed stone roof tiles, indicating that the roof fell in some time after the date of the coin (Wilmott 2001 p.121). The north granary had been used as a rubbish dump after its roof collapsed in around 350, and the rubbish deposits included coins dated to the 380s and two penannular (ring) brooches of a type dated to the very end of or just after the Roman period in Britain (Wilmott 2001 p.121). A new flagstone floor was laid on top of these deposits, and shallow post-holes were made in the tops of the surviving walls by removing a few stones from the wall core. At the western end, the post-holes continued beyond the end of the original granary structure, encroaching on the Roman street. This suggests that the north granary was rebuilt as a timber building, re-using the remaining Roman walls as foundations (Wilmott 2001 p. 121). This timber building was the same width as the Roman granary and a little longer, and was therefore a large building, something like 25-30 m long. This is comparable with the size of the fifth/sixth century hall excavated at South Cadbury (though a different shape; the South Cadbury hall was 10 m x 20 m, while the Birdoswald granary was longer and narrower), so it was big enough to be the hall of an important ruler. It must have been built after the 380s on the evidence of the coins beneath the new flagstone floor. If it was the functional replacement of the “chieftain’s hall” in the south granary, then it was presumably built at or after the time of the roof collapse in the south granary. At some later date, this timber hall constructed mainly on the foundations of the north granary was replaced by a second timber building with a different footprint. This second timber building was also hall-sized, 23 m by 6.8m, and was built partly over the site of the granary and partly over the adjacent street to its north (see sketch plan B). On the street, a line of stone post pads that would have supported timber posts were laid on the street surface, and on the granary shallow trenches were cut into the floor and stone post pads laid on the bottom of the trenches (Wilmott 2001 p.121). The north wall of this second timber building aligned with the centre pillar of the west gate; as the south portal of the gate had been walled up in the Roman period (see above), the hall was now lined up about as closely as it could get to the current entranceway, and would have been the first structure seen by anyone entering through the west gate (Wilmott 2001 p.121). (Constructing a hall directly opposite the gate would probably have been difficult because of the rectangular building and the exercise basilica on the north side of the street. Whether the exercise basilica was still intact or partly ruined by this date its massive walls and pillars would presumably have constrained any subsequent construction for some considerable time). Both these big timber halls on the site of the north granary were associated with smaller timber buildings built against or close to the western fort wall, south of the west gate. an eighth-century Anglo-Saxon disc-headed pin found outside the fort to the east (Wilmott 2001 p. 129). The Anglo-Saxon brooch and pin could indicate contemporary trade contacts, conquest, loot, travel, occupation, marriage links or many other interpretations besides, or perhaps just a casual loss at some much later date. It’s impossible to read much into two isolated finds; the most that can be said is that they are not inconsistent with early medieval occupation or activity at Birdoswald, perhaps extending beyond the likely date of the post-Roman timber halls. A long cist grave is essentially a stone box or coffin constructed within the grave, usually from stone slabs. As far as I know they are usually associated with early Christian sites in Britain, and Ken Dark considers them to be an indicator of a late/post-Roman Christian culture that spread in the fifth and sixth centuries to areas that had been outside or on the periphery of Roman Britain, such as Wales, Cornwall and the region north of Hadrian’s Wall (Dark 2002). Long cists are widespread in fifth- and sixth-century cemeteries in south-eastern Scotland (Dark 2002, p. 203), which is not so very far from the Birdoswald area. Furthermore, the centurion’s quarters at the end of one of the barrack buildings in the north-west corner of Birdoswald fort was remodelled some time in the late fourth century and acquired a rounded west end (Wilmott 2001, p. 119). This may be an apse, which in turn may indicate that the building was being used as a Christian church, which in turn may indicate that at least some of the occupants of the fort were Christians. A single long cist grave, undated, could mean almost anything. Again, about the most that can be said is that it would not be out of place for an early medieval Christian living at Birdoswald to be buried in a long cist grave. How long did the post-Roman occupation of Birdoswald last? More on this in a later post. * Camboglanna is now thought to refer to the next fort west, at the modern site of Castlesteads. Camboglanna is one of the candidates for King Arthur’s (legendary?) last battle at Camlann, favoured by proponents of a northern location for King Arthur. Bede, Ecclesiastical history of the English people. Translated by Leo Sherley-Price. Penguin Classics, 1968, ISBN 0-14-044565-X. Dark K. Britain and the end of the Roman empire. Tempus, 2002. ISBN 0-7524-2532-3. Wilmott T. Birdoswald Roman fort: 1800 years on Hadrian’s Wall. Tempus, 2001. ISBN 0-7524-1913-7. I thought I had put up a photo of the timber posts that mark the second hall in Birdoswald, but it turns out I didn't. I used the photo only in the lecture about the Hadrian's Wall and Limes Germanicus I held at the university last summer. Gotta dig that one up. Just how far post-Roman? Presumably not terribly much later. All of this lends itself to the mental picture of some auxiliary commander taking charge in his own name after orders no longer come from Higher Up. And then his wife or girlfriend convinces him to ignore Procedures and set up housekeeping on post as his de facto queen. Sic transit gloria! You put an asterisk after Camboglanna as if you intended a note, so I'll fill it in: 'Camboglanna' is apparently the original form of Camlann, as in Arthur's final disastrous battle. But an odd mistake to get into the Notitia Dignitatum! Gabriele - If you post some photos of Birdoswald, let me know and I'll link to the post. Rick - Seamless transition, so late Roman to post-Roman without a break to speak of. More information on the dating in the next post. Commanders were allowed to have their families with them from the beginning - see the assorted Vindolanda Letters from the commander's wife inviting her friend (wife of the commander down the road) to her birthday party etc. Serving soldiers were officially allowed to marry in the Late Empire (late third century or so? Don't quote me on that). One theory about why several fort vici seem to go out of use in the third/fourth century is that the civilians moved into the forts. So the presence of the leader's wife or girlfriend wasn't necessarily against Procedures; all that probably changed was the title, if people started calling her queen instead of 'domina'. 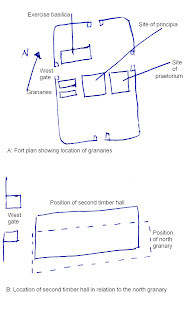 The transition scenario you mention is the most likely explanation of the evidence - the commander's house and the headquarters building fall into ruin or become impractical to maintain, so the current commander starts using the south granary to replace both functions, then when the south granary falls down he or his successor puts up a timber hall on the site of the north granary. This might have started happening even before orders stopped coming from Higher Up. I missed copying the Camboglanna footnote over when I posted the text, so I've now added it. Thanks for pointing out the omission! The stone roof of the north granary collapsed in around 350, dated by a coin of 350-353 found beneath the drifts of fallen roof tile. Aggh, cue numismatic paroxsyms... We've got a site chronology here which relies on gaps between issue dates of coins of thirty years, but late Roman bronze sometimes circulated for three times that, the early coins could easily have been in use for longer than that whole sequence. That said, it's significant that new coins were still reaching the area as late as 380, but the subsequent ruin and demolition could be all over the place chronologically compared to this scheme. That might help deal with the idea we otherwise seem to have of a military base functioning out of a half-ruined fort. I mean, what would that do for morale? Any commander worth their salt would have fallen-in buildings demolished, not left looking as if there was nothing worth defending, surely. It seems awkward to me, anyway. I have a few Roman fort books, but wish I could see the lay of the land and outlines of buildings. Much easier to visualize what you're writing/drawing about that way. I'm jealous, all I have is a cavalry fort from the 1860's to look at. Tenthmedieval - I should have said 'after 350', rather than 'around 350'. The roof collapse must have been after the coin was manufactured, but how much after is a different question. It's possible that the wear patterns on the coins may give an idea of how long they had been in circulation, though that would be subject to variations; a coin that spent most of its life in a strong box could remain apparently unworn for long periods after issue, whereas one that was in constant market exchange and/or jingling in a pocket with lots of other coins would get worn relatively quickly. It's possible that the north granary was deliberately demolished, since it seems to have been used subsequently as a rubbish dump. Another possibility may be that the fort was temporarily unoccupied or reduced to a skeleton garrison for a short period, during which the granary collapsed, and when it was later reoccupied the commander just used the buildings that were still habitable and ignored the ones that weren't (perhaps treating them as a convenient quarry, or perhaps intending to get round to them one day). There were plenty of alarums and crises in Late Roman Britain that could conceivably have resulted in some or all of a fort garrison leaving their base, temporarily or permanently. One can imagine a smaller unit than the fort had been originally designed for, either the remnants of the original garrison after part had been borrowed for duty elsewhere, or a later replacement, sort of making camp within the defences. I don't think archaeology would necessarily be able to detect a short spell of abandonment (but don't quote me on that). One could construct a scenario of a commander who could no longer call on the resources of the Roman Army and reckoned his men's morale would benefit more from fixing up the south granary as a hall, repairing the defences and organising reliable local food supplies, than from clearing derelict buildings. The whole sequence could have happened later than the late fourth century, perhaps much later, if the coins had been around for a while after their issue dates. I'll have more to say on the dating in a later post; it wouldn't all fit in this one. Constance - sometimes the land has changed quite a bit in the interim, due to drainage or changes in land use or rivers moving their courses etc, and often there's only a few earthworks or grassy humps and bumps visible of the buildings. Reconstruction drawings in books can be very helpful in trying to imagine what the buildings might have looked like in their time. Got some photos up here. For the lay of the land try clicking on the Google Map link at the bottom of the main post. There are bases near me with WW II era buildings and other facilities in various states of abandonment, and they are basically just kept somewhat tidy. If a roof collapsed, a commander might not want to pull down the walls; at some indefinite future date there might be means to restore it to use. Forgot to add, thanks to Gabriele for the pix! Gabriele - Cheers, I've added a link. Hank, Constance - Google Maps' satellite images can be very useful. Rick - quite; if the walls are still sound you might well leave them alone as long as they weren't actually dangerous and if you didn't need the building materials for something else. Even the shell of a roofless building might be useful as a sort of walled courtyard, maybe for animals or for storing the kind of things you can keep under tarpaulins. And there's always the 'when resources permit' wish-list, not to mention that you might have more urgent things to do than demolition, which takes a fair amount of manpower to do safely. There's also the possibility of a change of policy, either in response to external events or internal changes of priority. If the fort was neglected as a low priority or even outright abandoned for a while, then a change of policy brought in a new commander and/or a different garrison with instructions to do the best they can with whatever's left on the ground, that could easily produce a military base operating out of a half-ruined fort, on the logic that it was easier than operating out of no fort at all or building a new one. Am I right in saying that the post-Roman building was dated to be in existence until around 520AD? Badonicus - Hello and welcome. The date of 520 AD is the excavator Tony Willmott's estimate. There is very little hard dating evidence, so the dating is based on a few late Roman coins together with guesstimates of a plausible lifespan for the two phases of timber halls. More details in my post about dating the Birdoswald halls here. The timber halls could have gone out of use before 520, or could have lasted longer (perhaps considerably longer). There's a wide margin of possibility around the 520 AD date. Thanks for the link Carla. Great stuff. Interesting that you think there might be a link with Arthuret. I'm also interested in Birdoswald (Banna) for my historical Arthur studies and screenplay (see blogs at my WordPress). That possible date of 520 is interesting, especially with some identifying Camboglanna as Arthur's last battle of Camlann around the this time. All just theories of course, an Arthur of Badon may or may not have existed, but very interesting never-the-less. The battle of Arthuret as entered in Annales Cambriae was well after 520 AD (see my post on the battle here). The possibility of a connection is mainly derived from the traditional site of the battle being in roughly the same area, although the site of the battle is not certain. If there is a direct connection between Birdoswald's post-Roman occupants and Arthuret, it would tend to imply occupation at Birdoswald extending beyond 520 AD, either in the timber halls on the north granary or elsewhere on the site. Which is possible, if the timber halls had a longer lifespan than the 50-year guesstimate that underlies the 520 AD date, or if they were replaced with another building that hasn't been identified in excavation. But far from certain! (like almost everything else in this period). You can fit the pieces together in numerous ways.